An early prototype of the silicon-chip-sized particle accelerator that physicists at Stanford are working on. Eventually, miniature accelerators might have a role in radiating tumors, the scientists say. Lasers are key to adding the energy needed to accelerate the particles, and powerful lasers require powerful stop signs. This emergency shut-off button can quickly cut the electricity to the Stanford lab's lasers. "An accelerator is a way to add energy to particles," says Robert Byer, a physicist at Stanford University. Once you have those energetic particles, you can do things with them, like irradiate tumors or generate X-rays that scientists use to investigate new materials. An accelerator built this way would bring an accelerator's usefulness within the reach of more researchers. "We need to focus the electrons," Byer says. "We need to bunch them so they surf the wavelength of light right at the crest, so they get the maximum acceleration." "The acceleration channel is very narrow, so you have to generate a very, very narrow electron beam that you can send through the channel," Hommelhoff says. 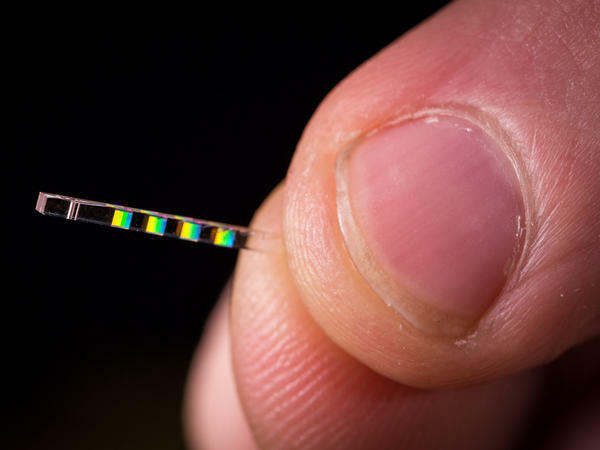 "It's a little like threading an invisible needle," says Dylan Black, a Stanford graduate student in physics. Black points to a bright circle of light on a monitor's screen. "That there is a picture of what the electron beam would look like if you put your eye right in front of the beam," Black says. "Which I would not recommend," interjects Ken Leedle, a research engineer working on the accelerator-on-a-chip project. "Depending on how much progress gets made, I would say five to 10 years," England says. England is enthusiastic about the promise of these small-scale accelerators. "One of the applications could be to take one of the fairly bulky, 10,000-pound accelerator devices that's used in hospitals for radiation therapy and make that into something that's chip-sized," he says. In addition to saving huge costs and space, it might eventually be possible to insert a chip-sized accelerator into a patient's body, where it could directly irradiate a tumor. Even though it may take a decade or more, Robert Byer is convinced smaller accelerators will become a reality. His isn't the only lab working on the idea. And besides, he points out, new technologies often start out bulky. Take the first laser to come on the scene. "Early on, lasers were big — and they were inefficient and they took all the power and water in your building to operate them," Byer says. "They got more and more efficient because we converted to semiconductor lasers and solid state lasers — and all of a sudden, lasers then became everywhere." Particle accelerators tend to be giant devices, racetracks miles long. They send electrons or protons whizzing around with unimaginable energies at nearly the speed of light. Now, scientists in California want to build a different kind of accelerator. As NPR's Joe Palca reports, the accelerator these scientists have in mind would fit inside a shoe box. JOE PALCA, BYLINE: First of all, what exactly is an accelerator? ROBERT BYER: An accelerator is a way to add energy to particles. PALCA: Robert Byer is a physicist at Stanford University. If you want to add tons of energy, you need a giant device. But if your energy needs are more modest, you can use silicon chips. Byer points to what looks like a small rectangle of glass inside a clear plastic dish. BYER: And there are actually four accelerators on this small chip. PALCA: Byer has been trying to shrink the size of particle accelerators for more than 40 years. His chip-sized accelerator uses lasers to add energy to electrons as they zip through a tiny channel in the chip. Byer's colleague, Joel England, is from the nearby SLAC National Accelerator Laboratory where they have one of the giant devices, more than three kilometers long. He says a chip-based accelerator would have many uses. JOEL ENGLAND: One of the applications could be to take one of the fairly bulky 10,000-pound accelerator devices that's used in hospitals for radiation therapy and make that into something that's chip sized. PALCA: In addition to saving huge costs and space, it might be possible to insert a chip-sized accelerator into a patient's body where it could directly irradiate a tumor. But small-sized accelerators present new kinds of problems. In the basement of the Spilker Engineering building on the Stanford campus, they're trying to resolve those problems. UNIDENTIFIED PERSON #1: Can we come in? We have a tour. PALCA: We put on glasses to protect our eyes from the powerful laser light used in the pint-sized accelerator. A big red emergency shutoff button attached to a shelf suggests this is not equipment to trifle with. Peter Hommelhoff of the University of Erlangen in Germany says one of the big challenges is to keep the electrons in the accelerator traveling where you want them to. PETER HOMMELHOFF: The acceleration channel is very narrow, so you have to generate a very, very narrow electron beam that you can send through the channel. PALCA: Graduate student Dylan Black describes the challenge this way. DYLAN BLACK: It's a little like threading an invisible needle. PALCA: Right now, the accelerator they're building is considerably bigger than a shoe box. With lasers and lenses and pumps scattered around benches in the lab, it takes up a fair amount of space. But this is just a prototype. On a monitor screen, Black points to a bright circle of light. BLACK: That there is a picture of what the electron beam would look like if you were to put your eye right in front of the beam. UNIDENTIFIED PERSON #2: Which I do not recommend. BLACK: Yeah, don't do that. PALCA: Wasn't planning on it, and there's always that big red emergency cutoff button should I forget. Optimistically, any practical applications for the laser Robert Byer and his colleagues are developing is five to 10 years off. But Byer is convinced smaller accelerators will become a reality. His isn't the only lab working on the idea. And besides, he points out that a lot has changed since the first laser came on the scene. BYER: Early on, lasers were big, and they took all the power in your building to operate them. They got more and more efficient. And all of a sudden, lasers then became everywhere. PALCA: Byer says even new mobile phones have lasers in them. The day of the tabletop accelerator is coming, he says. 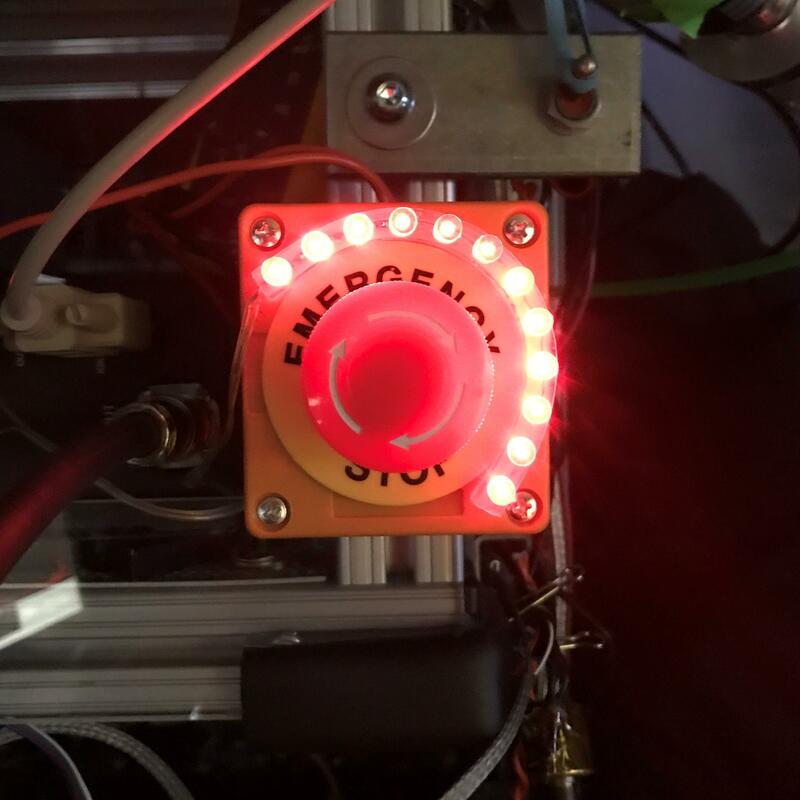 As the lab tour was wrapping up, Dylan Black asked me if I would like to shut off everything by pushing the big red emergency shutoff button. PALCA: OK. Joe Palca, NPR News, Palo Alto, Calif.
That was great. Thank you - high point. Transcript provided by NPR, Copyright NPR.